If your pooch has ever struggled with anxiety, fearfulness, or over-excitement, then our Thundershirt Calming Jacket for Dogs is the perfect solution. The Thundershirt has everything you need to help reduce anxiety and keep your dog calm. It wraps around their torso and applies constant, gentle pressure while in use, much like swaddling a baby. The Thundershirt has been shown to be effective more than 80% of the time! If your dog experiences fear or anxiety during thunderstorms, fireworks, or any other frightening situation, then the Thundershirt is essential to your needs. Not only is this Thundershirt incredibly effective, but it is also very easy to use. When your new calming wrap arrives, you’ll receive detailed step by step instructions on how to put it on your pooch. Simply wrap the flaps around your dog’s body and neck, then secure it with the velcro fastenings. 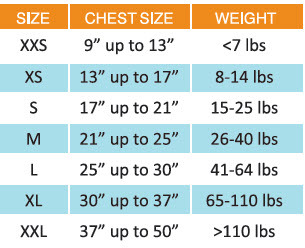 Available Sizes: See sizing guide at bottom of page for more information.